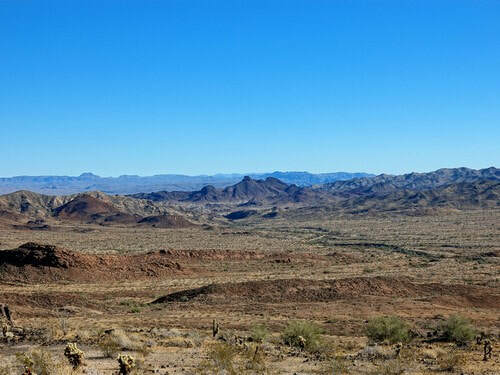 Great views from a mesa surrounded by the Buckskin Mountains. We are not sure why this trail is called Black Mesa. 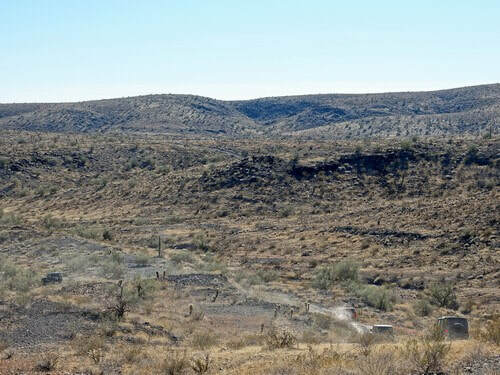 The USGS Topographic Map calls this formation the trail is on "The Mesa". Perhaps because the mesa appears somewhat black, or perhaps because it would be confusing to refer to as "The Mesa". 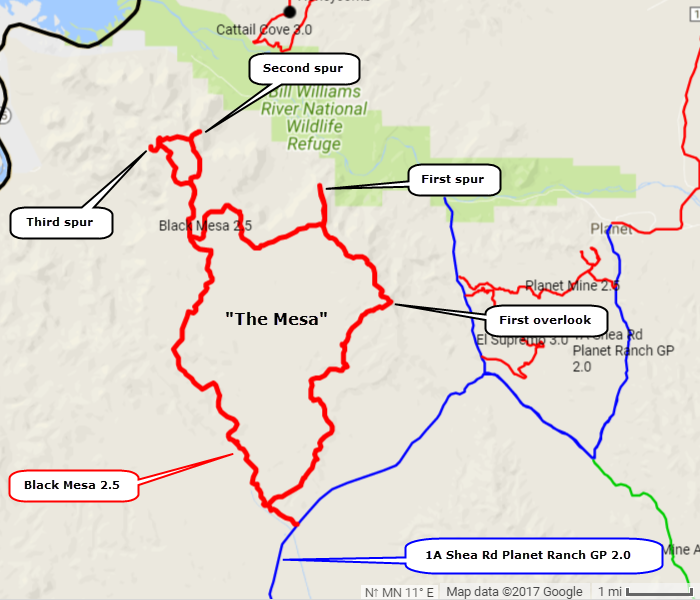 People would always be asking What mesa?. There are a few rocky hills, thus the 2.5 rating. We went in a counterclockwise direction. 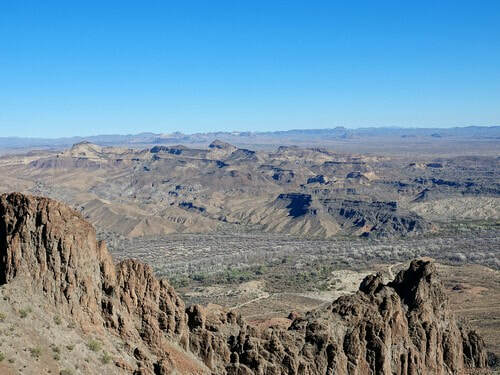 Climbing up to the mesa provides nice views of Mineral Wash and the mountains beyond. About 5.5 miles into the trail you will come to the edge of the mesa. This is the first major overlook and is a good spot for lunch. The pointed hill in the foreground is Mineral Hill. 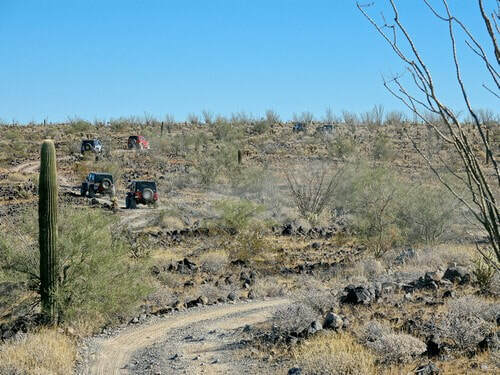 There are several Jeep trails in the distant mountains. 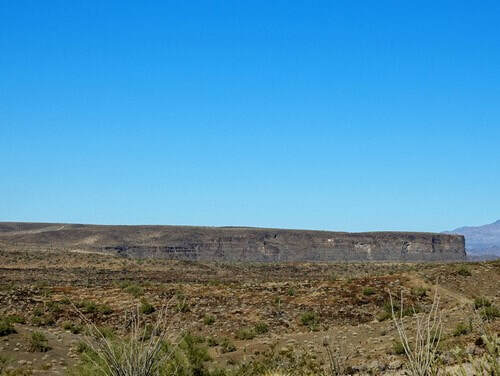 ​Drive along the edge for a ways then turn away and drive across the top of the mesa. There are no "Oh, Ah" moments along the top, but the drive is still interesting. 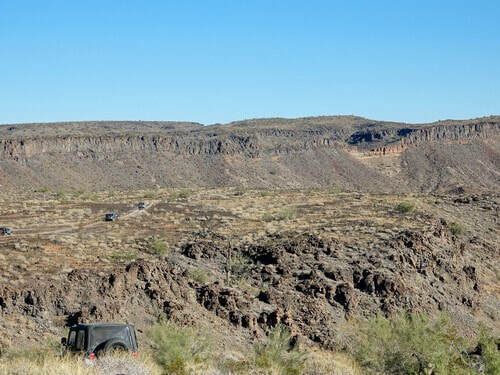 The first spur shown on the map, and in the GPS track, goes to an overlook out on a point. We were a fairly large group and our trail leader said there was not much turnaround space so we did not go out on it. She also said there was perhaps an eighth mile walk to get good views. 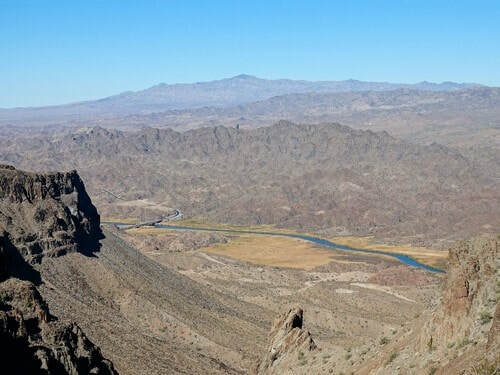 We continued to the second spur and experienced a scenic vista of the Bill Williams River, Bill Williams National Wildlife Refuge and the Bill Williams Mountains beyond. The third spur is the highest elevation of the trip with views in all directions. Water in the middle of the desert! Metropolitan Water District delivers water to 19 million people in Los Angeles, Orange, Riverside, San Bernardino, San Diego and Ventura counties in California. 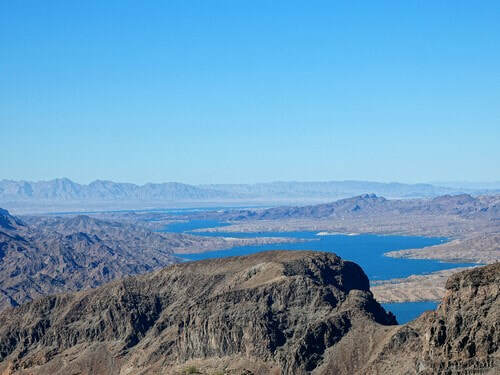 Water is first pumped from Lake Havasu at 450' elevation to Gene Wash Reservoir at 741'. It is then pumped to Copper Basin Reservoir at 1,037'. 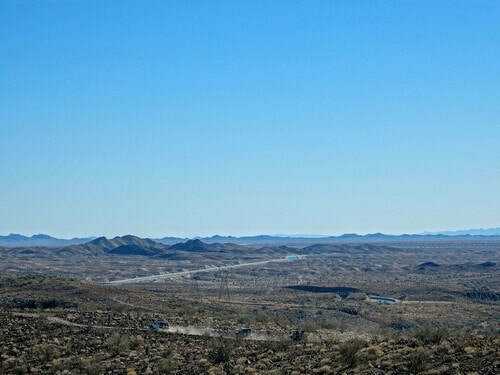 It then flows southwest through the Whipple Mountain Tunnel to the Colorado River Aqueduct. Turn south and travel down off the mesa. 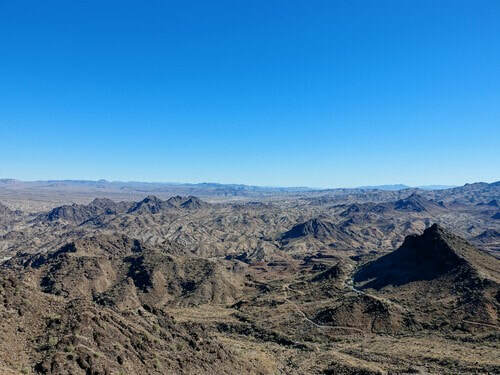 The Central Arizona Project (C.A.P.) canal is visible in the distance. More water in the desert. C.A.P. 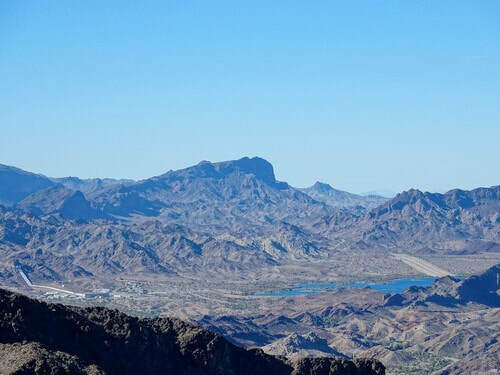 is a 336 mile long system that delivers water from Lake Havasu on the Colorado River to Phoenix, Tucson, and points in between. There are 14 pumping plants with 115 individual pumps that lift the water a total of 2,900 vertical feet. Operating these pumps makes C.A.P. the largest user of electricity in Arizona. The coal fired Navajo Generating Station near Lake Powell was built in 1974 specifically to provide electricity for the system.